Enjoy one of our luxury body treatments for your skin that radiates with health and is soft to the touch. Carefully balanced to both deeply cleanse and replenishing, our body treatments lift the veil of dullness and dryness to restore hydrated silkiness to your skin. Our goal at Serente Spa is to achieve beautiful lasting results for our clients and an exceptional overall experience. Our body treatment therapies are designed to help detox, rehydrate and re-mineralize your skin for total body rejuvenation. Burns up to 1200 calories, controls weight and reduces cellulite. 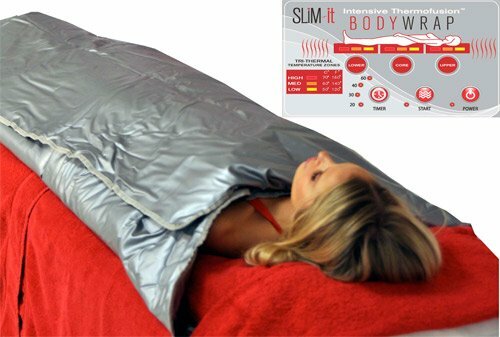 As you relax in the infrared blanket, your body is actually hard at work producing sweat, pumping blood, and burning calories. You would burn as many calories as you would jogging for 30 minutes. Since the radiant heat of the infrared therapy system warms many times more deeply as conventional saunas, it is significantly more effective at reducing cellulite. A deliciously warm experience for the body. This wrap is a rich and creamy mud full of vitamins and minerals from the healing waters of Monticelli, Italy. Relieve the ache of sore muscles and swollen joints in addition to restoring balance and renewed energy with this detoxifying treatment. A firming and anti-aging treatment with extraordinary hydrating effects from Kamani oil. Penetrates deeply to stimulate collagen synthesis and promote cellular regeneration of the skin leaving it deeply moisturized and looking years younger. A super hydrating, soothing and firming mask of botanical extracts including tomato, artichoke, basil and pumpkin leaving the skin nourished, toned and glowing. Served with a glass of V-8 juice. This unique body therapy combines dry brushing and infused salt scrub to gently exfoliate flaky, dry skin, regenerate new skin cells and draw out impurities for a fresher, healthier glow. Your skin is then nourished with luxurious aromatherapy body oil.